Aquariums should be pretty to look at, so the water should be clean and bright. The plants and fish should also look vibrant and lovely. Along with the filter, the filter media plays a huge role in keeping the water clean and the inhabitants healthy. Before you choose from our top choices of best filter media, here's some helpful information for you. Mechanical media filters out any visible particles from the aquarium. This includes fish feces, uneaten fish food, and dust. The water passes through the media, which catches or strains the particulate matter. When choosing a mechanical filter media, think about the size of the pores. The size determines what particulate matter you'll be able to extract. The smaller the pores, the more it will be able to filter out even the tiniest particulate matter. However, fine media clogs faster and is harder to clean. Some are even not reusable. The great thing about mechanical media is that it doesn't interfere with the water chemistry. However, you need to clean it regularly to get rid of the dirt it holds. You will only need to replace it if the media doesn't let go of the dirt it holds anymore. Some examples of mechanical filter media filter wool, sponges, and polyester pads. They are usually the first layer of filter media, with biological media coming second, and chemical in last. A biological media is anything that can house bacteria that can reduce the nitrogen content in the water. An advantage of bio media is that it's natural. It can keep a planted tank clean for many months before you will need to change it. If you use bio media, make sure that it is not clogged, so the oxygen flow continues. Otherwise, the beneficial bacterias might die. Some types of biological filter media are ceramic rings, bio balls, sand, gravel, and some sponges. Some of these biofilter media can also act as a mechanical filter media. Chemical media, as the name suggests, uses chemicals to remove toxins and impurities from the water. They work very fast and can clean up the water in just a few hours. The downside is that they can alter the water chemistry. That's why they are also usually the last in the filtration system (after mechanical and biological). If you place the chemical media first, then it will clog up very fast. It will also lose its chemical filtering properties quickly. If you place after mechanical and before the biological media, you risk removing the constituents that beneficial bacteria need. This means that the live bacteria in the biological media will die or not thrive. Some examples of chemical filter media are activated carbon, peat, and ferric hydroxide. We recommend that you get a customizable filter along with your filter media. A customizable filter allows you to use any filter media and to change the materials. This is ideal, so in case you encounter problems in the future, you won't need to change the whole unit. When buying a filter, make sure that the compartments are durable and easy to access. A media bag is also convenient and prevents any accidental spillage of filter media in the tank. 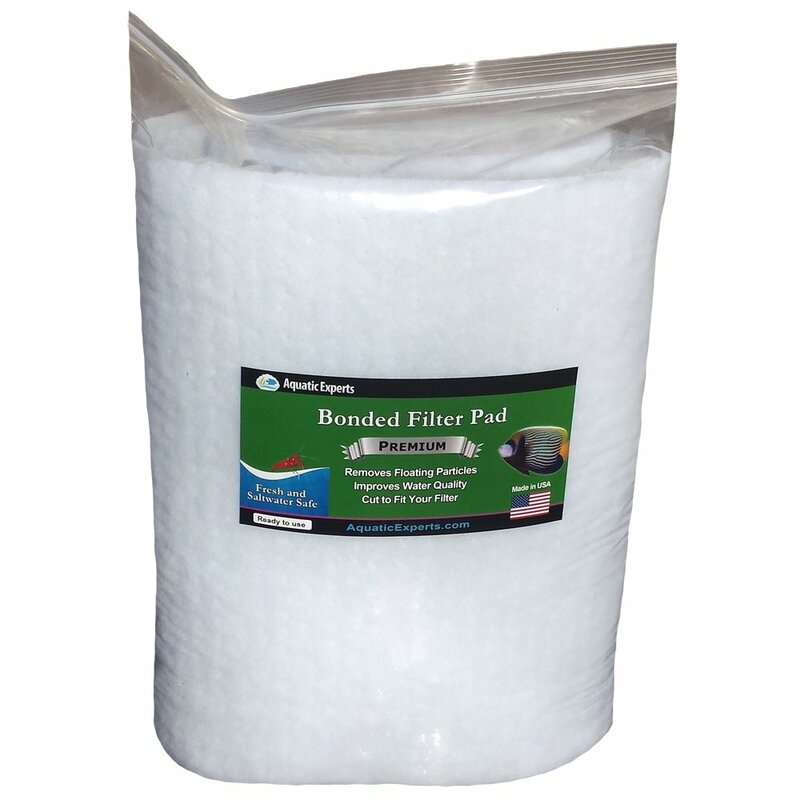 It makes cleaning and replacing filter media easier. Make sure the filter stays clean. Some brushes can go through the tubes so you can prevent clogging them up. These are some of the best filter medias in the market. Remember, you can use all three types of media together, ideally in the following order: mechanical, biological, and chemical. However, always make sure that they are compatible with your filtration system. 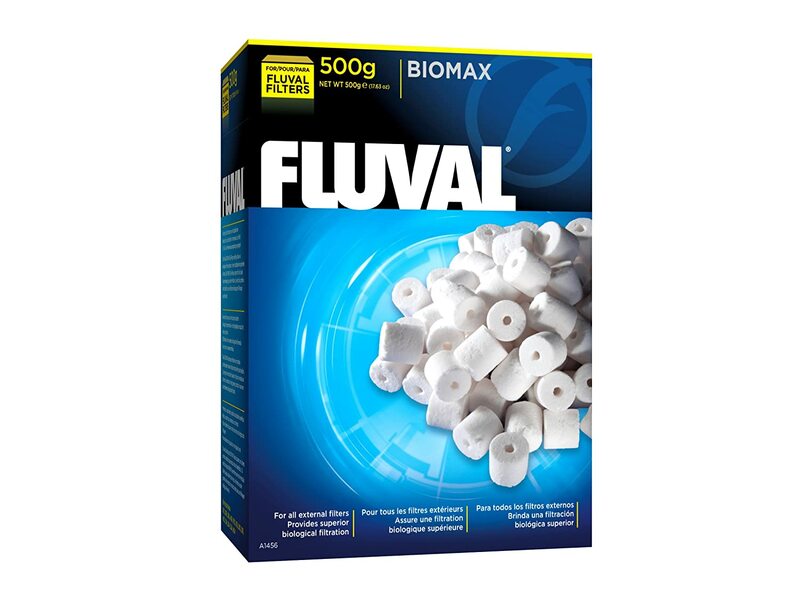 The Fluval Biomax is a biological filter media that utilizes ceramic rings. These rings have many channels and tunnels with tiny pores that can support large amounts of beneficial bacteria that purify water. Biomax is a great aquarium filter media that won't alter the water characteristics. It promotes nitrification or the conversion of ammonia to nitrite to nitrate. The shapes of the filter media allow a smooth flow of water to ensure enough time for efficient biological filtration. Allows beneficial bacteria growth and promotes cleaner water by reducing ammonia and nitrite. ​Designed specifically for Fluval Multi Stage Canister Filter, but can work with many other filters as well. ​It’s widely used, so it’s reliable and trustworthy. A few pieces found broken before use. It does not come with a net or mesh bag. 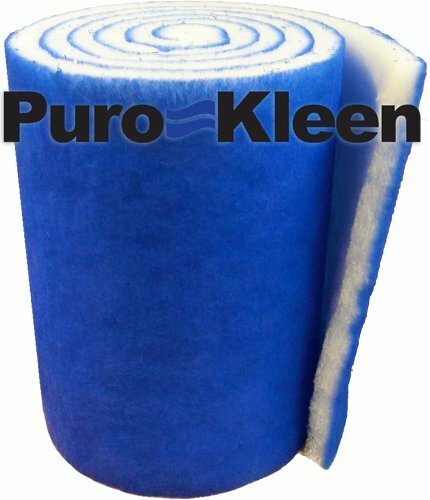 The Puro-Kleen Kleen Guard Filter Media is a mechanical filter media that uses 15-micron nominal polyester fibers. It comes in 12 by 72 inches and is around 1.5 inches thick. ​Filters fish feces and other small and visible matter. ​It’s easy to cut and use. Non-toxic; doesn’t alter water chemistry. Does not remove ammonia and nitrate from the water. ​Though you can cut it easily, it’s not difficult to fit in some filter canisters. 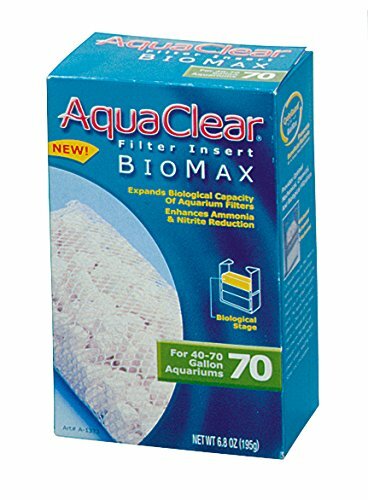 Aquaclear Biomax is also a biological filter media that allows beneficial bacteria to dwell and grow in. It's much like the Fluval Biomax in shape and function. It's designed for the Aquaclear 20 Power Filter, but can be used on other filters as well. ​It comes in a mesh bag for easy cleaning/replacement. It’s more brittle than the Fluval Biomax. The mesh bag does not hold up well. The Aquatic Experts Premium True Deal Density Filter Roll lives up to all the positive ratings. They have over 90 percent 5-star ratings, making this roll a top choice. It’s very easy to cut to fit your filter, and it's also ideal for both freshwater and saltwater aquariums. The roll is used polyester fibers with resin bonding for extra strength. ​The fibers are dye free and can trap any feces, decaying plants, dust, uneaten food and other small particles. It’s easy to cut to fit. It’s also easy to clean or replace. You can also use it in terrariums, turtle tanks and more. Might get stuck in some filters. Will only remove the visible particles. It cannot get rid of ammonia and nitrate in the water. The last great filter media you should consider is the reliable brand, Marineland. 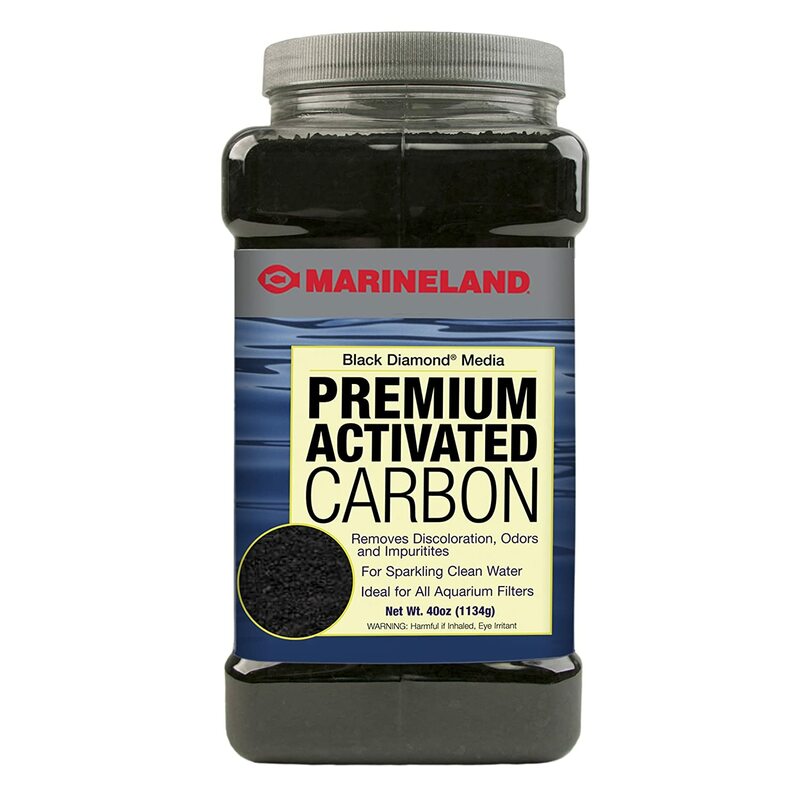 The Marineland Black Diamond Premium Activated Carbon is a chemical filter media that gets rid of discoloration and impurities. It also gets rid of foul odors. Another great reason to get this filter media is that it works extremely fast. If you want to show off your tank, drop some of these the night before. You'll see a significant difference in the morning. It works fast to clear and clean up water. ​It also has a reasonable price. Removes ammonia and nitrate from water. The size of the particles might not be suitable for some filtration systems. It can be messy to clean or replace. Choosing a filter media for your aquarium is crucial just to make your tank look pretty, but to keep your pets healthy. A dirty tank can cause ammonia poisoning in your fish. There are three basic types of filter media - mechanical, biological, and chemical. You can use one of them or all of them; it’s up to you. Just make sure your filtration system uses them too. There are so many options of filtration media. For me, the best mechanical option is the Aquatic Experts Premium True Dual Density Filter Roll. Then for biochemical filter media, the best one is the Fluval Biomax. Finally, for chemical filter media, the winner is the Marine Black Diamond Premium Activated Carbon.